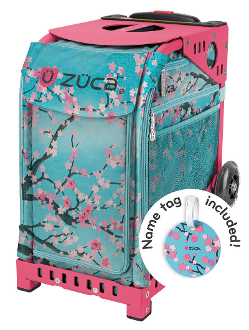 ZUCA Hanami Insert & Frame features cheery pink cherry blossoms against a bright blue sky make every day feel like the first day spring. These bags are great for kids on competitive sports teams. You can use them to haul all your gear and you can sit on them when seating is limited at competitions. Can also be used as weekender bags when you purchase the Pro Packing Pouches. The optional Pro Packing Pouch Set includes five packing pouches of various sizes and a one quart TSA compliant toiletry bag to help you pack like a pro. The Pro Packing Pouch Set fits both the ZÜCA Pro and the ZÜCA Sport.